One by one they arrived – poodles and Pomeranians, mongrels and mutts – at the swimming pool in Mulvane, Kansas. But before jumping in the pool for the traditional end-of-summer dog swim on Aug. 12, the canines were blessed by the pastor of the Mulvane United Methodist Church. Each dog received a certificate, as well as a kerchief with the name of the church. 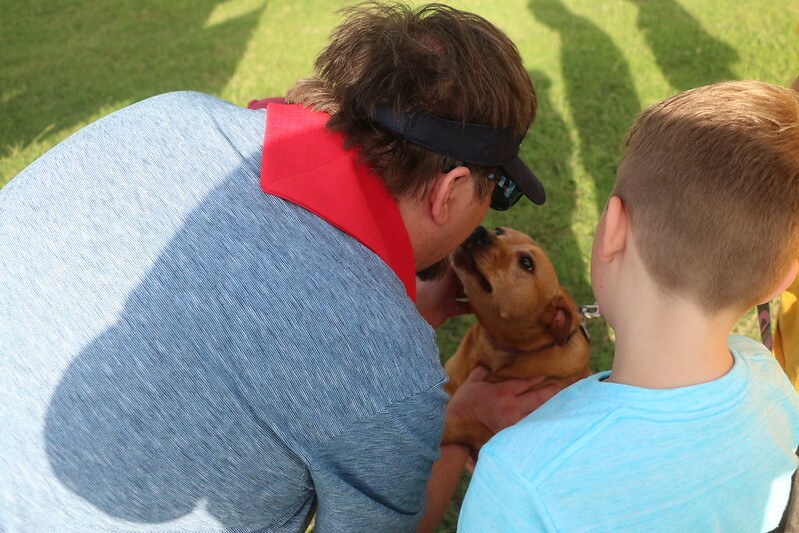 Dozens of dogs were blessed in the latest chapter of “The Outsiders,” an outreach and fellowship activity for the church. Outsiders events were weekly in the summer, monthly through the school year. They have included paying the way into the Mulvane pool one summer Sunday afternoon, buying out all the tickets for a new local theater company’s performance and inviting the community, and footing the bill for treats at a newly opened ice cream shop downtown. Todd, in his fifth year at Mulvane, said the idea came from a sermon series he preached last year about a “DNA change” that was needed in the church to take it outside the building. Outsiders events must be outside the church, engage at least 20 church members, put the church in contact with the community and has its members taking on any of 10 roles: welcomer, listener, neighbor, booster, ambassador, inviter, servant, witness, partner and receiver. Todd came up with the ideas for the first year, and the second year has handed it off to team members. “I was amazed at how many folks participated,” he said. The events are fun – giving “people an opportunity to reach out while in fellowship,” Todd said – but also meant to have church members invite others to join them. Bri DiMaiolo, the church’s director of student ministry, said she notices a new energy in the church. “It just feels like we’re living into our purpose as a church – living out our mission statement rather than just something we say every Sunday,” she said. Todd said he can see the effect that getting out into the community has had on church members.